Note this not a task for discussion (see: T55162). This is only to keep track of changes made in 2.8x. Here is a list of the main changes to know when moving to 2.8. F3: Operator Search (also Cmd-F on macos). AccentGrave: View axis pie menu. Alt-MMB(Click): Center on the mouse cursor. Note: this is a productivity feature for experienced users, intended as a fast alternative to the view manipulator or num-pad. Z: Shading modes pie menu. Ctrl-Tab: switch to FCurve editor. Ctrl-Tab: switch to Graph editor. Ctrl-Up (Toggle fullscreen), Use Ctrl-Space. Ctrl-Down (Toggle fullscreen), Use Ctrl-Space. Alt-Wheel (Frame offset), use Left/Right. D-* (All keys that use the D-Key as a modifier) NO REPLACEMENT. (updated to use tool-system, full grease pencil support has it's own modes). Shift-Z (VIEW3D_OT_toggle_shading, RENDER), use Z pie menu. Alt-Z (VIEW3D_OT_toggle_shading, MATERIAL), use Z pie menu. Ctrl-T Make Track NO REPLACEMENT (use Object menu). Alt-T Clear Track NO REPLACEMENT (use Object menu). Spacebar (operator search menu toolbar popup). Use F3. Alt-F10 (toggle fullscreen area). Use Ctrl-Alt-Space. Alt-F (VIEW3D_OT_view_center_pick). See Alt-MMB shortcuts. , and . are now orientation and pivot pie menus. Z: Toggle wire-frame shading (Use Shift-Z). Ctrl-Tab (Pose Mode / Weight Paint). Use Ctrl-Tab (Opens pie-menu or toggles pose mode for armatures). V (Vertex Paint Mode). Use Ctrl-Tab (pie menu). Ctrl-Tab (Select Mode), Use 1..3 (new edit-mode key). W: Adjust weight (Use Ctrl-F). W (Weld), Use Shift-W (make room for W-key context menu). F3 (Save As), Use Shift-S (make room for F3 search). T62925: Append shortcut work fine only in specify area of Blender window. T60539: Transformation manipulator shortcut same as max area shortcut in object mode. @Tomas (Rusculleda), Corrected first issue, Ctrl-Alt-Space works here. Were the view orbit shortcuts (shift+alt+mmb up/down and ctrl+alt+mmb up/down) changed or eliminated? They're not working here and I can't find them in input preferences. Hope I'm not being annoying but in case it helps, I also noticed Alt + Wheel is no longer assigned to frame offset. @Tomas (Rusculleda) not at all, thanks for the pointing this out, updated. Control + ` (Accent Grave) doesn't seem to work in Blender macOS. Pressing the Accent Grave key without Control for view selection does work. I can confirm the above comment, the key combo is good but actually I think the problem might be the manipulator is missing ing macOS - its been missing for a while in 2.8 (kind of assumed it was by design) - even changing the toggle to something simple e.g shift+h there is still no toggling of a manipulator. Could you try this with the 'Transform' tool active? (This should toggle on/off). Yes, that works. I didn't know that the gizmo is only visible when the Transform tool is activated. Is there also a direct keyboard shortcut for the Transform tool, in stead of Spacebar and then the T key? @Metin Seven (MetinSeven), no, but you can press Space-T in the same way you'd press Ctrl-T or similar bindings. Yup that does work so yup - so there will be no 'Select' Manipulator anymore? just the free grabbing - pretty sure I can get used to it quite fast. please dont use accents and tildes as shortcuts because in some languages this are dead keys. Though at some point I asked for something similar, now I don't belive not using those keys is the best solution, as some of those keys are positioned quite handily, and using only keys available in every keyboard layout would be limiting. I'm thinking maybe a better solution would be to have community maintained keboard presets which adapt the oficial keymap to the different layouts. For example, with spanish keyboards, blender takes the ñ key for the tilde shortcuts, and the question marks keys for the square brakets shortcuts. When I install blender on a new computer I usually change those shortcuts for more accesible keys (if posible, to the keys that lie on the position the oirginal shortcut key is suposed to be). If this kinds of adaptations were shared and made easily available I think we would be fine. hi Tomas, that would be pretty cool, i also have some custom shortcuts on the 2.79 version, but i'm trying out the defaults in this one and i'm adapting faster than i thought (muscle memory still plays some tricks on me), i've only alter the spacebar behavior, because F3 is too far away (i wouldn't change it if i had an equivalent to mac users with their cmd-f, lucky bastards!). My point about the keys is that, they should just work out of the box, i know i can remap them, but not everyone will manage to get there (the input preferences is massive) and i understand your point about handy position on the keyboard layout, but we are trading handy position of shortcuts by broken shortcuts (if you use the defaults). This comment was removed by Fahad Hasan (cgvirus). I need to remove Context menu on right click and replace it with Pan view while left click select option turned on. How is it possible to do? Another issue with Pan view on right mouse setup - cancelling any kind of action with RMB causes immediate panning instead of just cancelling. Looks like conflict with Transform modal map. Thank you for keeping transform modal map for knife tool, it helps a lot! It seems there is no ability to assign shortcut to shading.color_type, for quick switching to "textures" mode and back to "material" during UV unwrapping. It is quite essential, because checker texture disguises geometry, so the only way to work with UV is quick switching to textured mode to preview and then back to shaded to provide selections and operations. Also, manual switching "Shading" button is deep right, so there are no way to keep tools on left side of bar and shading button on screen simultaneously in UV Editing workspace. I used to use alt+Z, it was very handy for such purposes. 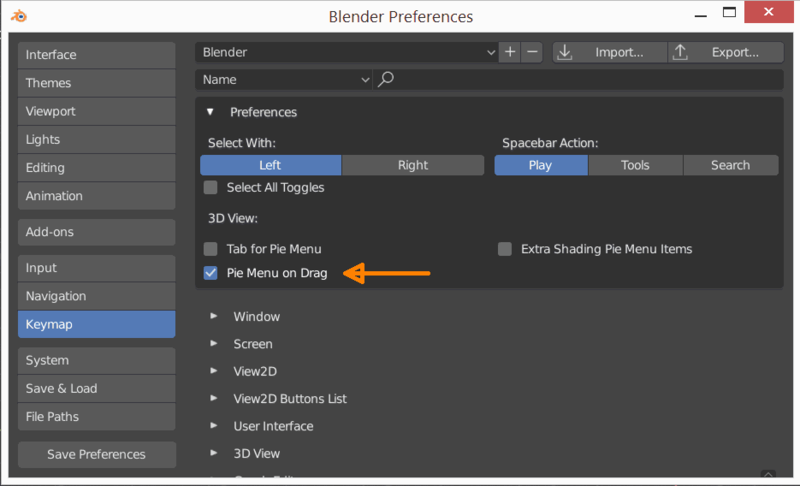 What about Alt + F11 that toggles Blender instance full-screen in Blender 2.79b? Will there be a replacement? Is the pie menu for manipulators going to be replaced by some other keyboard command? but CTRL+SPACEBAR for manipulators, comes in handy every 50 seconds in the same 2 hour period. Please reconsider adding this toggle manipulators (translate, rotate, scale) back into 2.8: it is a spine into modeling. @David (activemotionpictures) As noted in the changes: Ctrl-AccentGrave: Toggle manipulator. AccentGrave: 3D view pie menu. if I switch to an US-keyboard-layout it triggers all the right menus/actions, but of cause it is really impractical to switch keyboard layouts just to have basic shortcuts working, plus it is super confusing. Would it be possible to let blender know which keyboard-layout one is using and switch the AccentGrave to the according Button on each international-keyboard-layout or have a fast toggle in the splash screen for which key-binding we would like to use for the above actions. So e.g. german-keyboard-users could easily switch to use the degree sign instead. It seems important to me that at least the basic shortcuts should work in any international keyboard-layout. On a side node: I really miss the shortcut to open the user-preferences > I often just want to toggle some small settings on or off while working on a project.. Is there any particular reason that this shortcut was removed? Re: Ctrl-Space I think we're going to need a set of platform spesific workarounds since there are always conflicts with spesific configurations. These workarounds could ideally be detected, but at the very least they can be preferences. Note that Ctrl-Space isn't a new shortcut, its been used in Blender for years for auto-complete in the text editor and console. Re: Ctrl-Home/End, changing the start/end frame is not something you do frequently (as in many times a minute) while animating. For example - this is the shortcut for moving to the start/end of a document in many text editors. So I don't think it's an issue if it's not easily accessible with one hand. Further, this leaves keys such as Alt-S/Alt-E available for actions performed more frequently. Re: F6 redo, there is already a way to redo actions in editors that can redo (if there are exceptions, the redo panel will need to be added to them), having the F-Keys from F5..F10 means you can assign this if you like, but means there are keys free for users to assign their own functions, and I rather not drop this. It's not planned to add keys from 2.7x map back. Apply modifiers can be done w/: Ctrl-A, G.
Like some shortcuts are better than other not because they comply with to the principles of relevance, but because some were cursed by being used in previous versions, so they are not fashionable anymore. We are making software for work, this is an extremely delicate question, demanding obvious visual reasons. Please, be careful with that, we hope on this. @Paul Kotelevets (1D_Inc) the keys from 2.7x that we though worth adding back have already been added back. Well, hope that the opportunity to return them manually will remain. For groups icons in tool bar, I am highly recommended can use A key to expand, more quick than keep LMB press. Will have shortcut to show all collections. Thanks, looking forward to seeing more shortcuts. Yes, fully agree, assigning 1 to Scene Collection is required for consistency. It seems, W is cycling selection mode? The Shift ` shortcut for the navigation mode doesn't work. I'm on debian, with US international keymap and a standard qwerty keyboard. I suggest that either you make blender able to recognize the dead keys, either changing shortcuts. This comment was removed by Ian Crossan (lubeyrin). v 2.80.57 seems to behave different - there is also no more viewport rendering shortcut. Quick wireframe is available with Pie menu on Drag (a very nice solution), but It's still hard to guess what's going on. For example, editing object piemenu was good for gamedev, tab edit mode for almost everything else, that's why such a things are usually done as optional.